Robert Lynn was the son of James and Elizabeth Lynn, of Coalisland, Co. Tyrone. Robert was born on 14 November 1885 in Gortgonis in County Tyrone. The 1901 census shows Robert is not living with the family at Derry, Tullyniskane, Tyrone. James was a railway porter. Elizabeth was a dress maker. 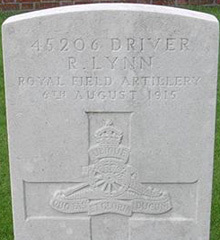 Driver Robert Lynn was serving with the 87th Battery of the Royal Field Artillery when he died in Ypres, Belgium on 6th August 1915, aged 30. 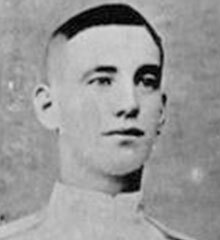 Driver Robert Lynn was one of four brothers who died on service; two are buried in Belgium, one in France and the fourth in Israel. In 1917, a plaque was unveiled in Coalisland Church of Ireland Parish Church in memorial of the Lynn brothers.